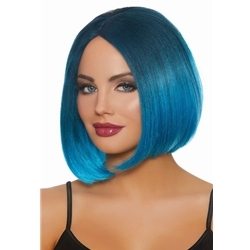 The Blue Ombre Fade Wig is a bob wig with two tone Steel Blue to Bright Blue color fade as pictured. This sleek wig features an Ombre style color fade, which means that a darker color atop the wig fades into a lighter color at the ends. The unique style makes for a fun way to add a personal touch to a Halloween costume or to spice up a night out. Store and display your wig with a Styrofoam Wig Head Kit. Customize your look further with tights and other accessories!